Huawei presented the Mate 10 Pro in October 2017. It is still an excellent smartphone that was a serious competitor to all of the flagships of 2018. The manufacturer introduced new top-range models this year, one of the strongest being the P20 Pro. Can it do better than the Mate 10 Pro? Are they really all that different? We’ll share our latest insights with you. The Huawei Mate 10 Pro may be an excellent smartphone (even in the long run), but it can’t stop time from passing. The Huawei P20 Pro, however, has an aesthetic strategy that differs from its predecessor on several levels. This is not a silly idea, as it makes it possible to clearly distinguish the P series and the Mate series. The family resemblances are undeniable, but the P20 Pro remains faithful to the P series in its appearance: the fingerprint sensor is still on the front under the screen. This isn’t anything new, but Huawei originally placed in on the rear, as they did on the Mate 10 Pro. Everyone has their own taste, and in both cases the sensor works very quickly. There’s still another notable difference: the notch. It’s been criticized and denounced over and over again. It was introduced by Essential with its Essential Phone and then popularized by Apple with its iPhone X. Although on the web many users are determined to criticize it, many other quieter users are far less demanding and have no problem buying the many devices that now offer the notch. The two devices have many things in common. Of course, there’s only a 0.1-inch difference in terms of the display size. The P20 Pro is slightly larger, but the embedded technology is the same: an AMOLED display. The resolution is slightly different, 1080 x 2016 on the Mate 10 Pro and 1080 x 2240 for the P20 Pro. Both displays are Full HD+. In everyday use, both screens are excellent at all levels. If you like the attention to detail, you might prefer the P20 Pro because in addition to its better resolution (the difference isn’t noticeable to the naked eye), it also offers a better screen-to-body ratio that covers 82% of the device’s surface. 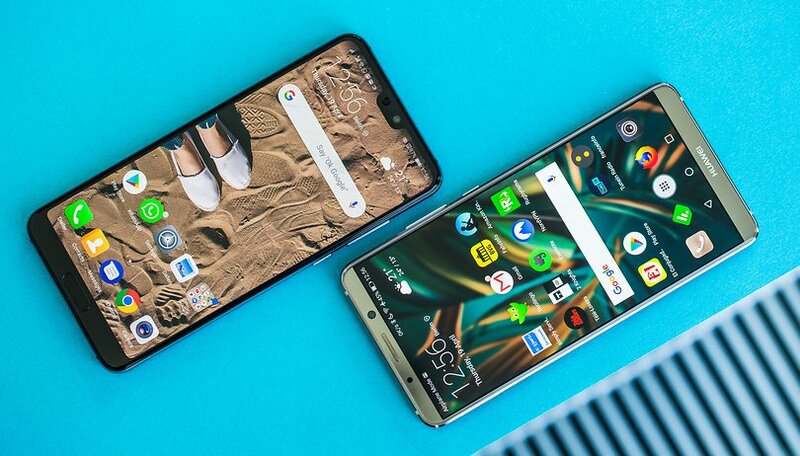 Both devices have a 4000 mAh battery, but according to my colleague Jessica: the P20 Pro offers good autonomy, but the Mate 10 Pro offers excellent autonomy. On the system level, both devices run Pie, the latest Android software. For all those interested in security: both devices have been updated and currently benefit from the latest security patch. They also both have the support of artificial intelligence. It should be noted that the P20 Pro supports facial recognition technology, whereas the Mate 10 Pro does not. Besides the camera, all the hardware is the same. Both feature the obviously powerful Kirin 970, along with its NPU chip for artificial intelligence, its octa-core processor (maximum speed of 2.4 GHz on its 4-core Cortex A73 and 1.8 GHz on its 4 Cortex A53 cores) and its Mali G72 graphics chip (12 pipelines). The rest of the specs are also the same: 128 GB of internal memory (UFS 2.1) and 6 GB of RAM, the same Wi-Fi configuration (802.11 a/b/g/n/ac), Type-C USB, stereo speakers, etc. The only regrettable aspect is that both phones come without a mini-jack port. There are some slight differences present, for example EDR support for Bluetooth, but in general the average user won’t notice any difference. If you just look at the exterior of the smartphones you’ll see one sizable difference: the P20 Pro has 3 cameras, while the Mate 10 Pro has just two. To be more specific, the Mate 10 Pro utilizes a 12 megapixel 1/2.9” sensor and f/1.6 aperture, combined with a 20-megapixel sensor with an f/1.6 aperture. The pictures are very good and you can preview them in our photos taken with the Mate 10 Pro. The P20 Pro uses two wide-angle modules, one color (40 megapixels, f/1.8 aperture) and the other monochrome (20 megapixels, f/1.6 aperture), and an 8-megapixel telephoto lens (f/2.4 aperture). The presence of 3 cameras can seem like a marketing ploy to make users think, “I have the most sensors”, but they really do make a difference. Since our tests, the P20 Pro has become a true reference point to compare other devices: its technical characteristics in combination with its software optimization and artificial intelligence make for an excellent smartphone camera. From the bokeh effect to the 5x hybrid zoom to the long exposure time, both the average user and the experienced one will be delighted with the results. Here’s the icing on the cake: it adapts very well to different lighting condition, so you’ll get quality photos even when the lighting is bad. With respect to videos, the P20 Pro generally has the same features as the Mate 10 Pro. Both record in Full-HD (30/60 fps) and 2160p (at 30 fps). The P20 Pro also offers slow-motion recording at 960 fps in 720p definition. This isn’t necessarily useful for the average person, but some users will appreciate this feature that was first introduced on the Sony Xperia XZ Premium and then was adopted on other devices, in particular, the Samsung Galaxy S9. All in all, the P20 Pro has some advantages over the Mate 10 Pro, but unless you’re a real photography fan these perks don’t justify the 250 dollar price difference. Are you interested in either of these devices? Let us know what you think in the comments! Which device do you prefer? I have the mate 10 pro.Brilliant. It's not true when you say it doesn't have face recognition!IT DOES!! !..Even works with glasses. Ok, so the differential isn't worth £200, but difference in TCO on contract is about £40 ( mate 10 £33 month , Vs p20 pro £33 month & £41.99 up front for same contract) does that change the situation?